Scooping clay litters can stir up dust particles. The best method for disposing of cat litter depends on the type of litter your kitty uses, as well as the plumbing in your home and your impact on the environment. These tips can help you balance your priorities to choose the best way to get rid of used kitty litter. Using mask is mostly optional, but for people who use litter that is extremely fine and becomes airborne during litter cleanings, a safety mask can prevent you from inhaling or ingesting litter particles. Litter scoops are relatively inexpensive and are sold at pet supply stores, as are small plastic litter bags. Many of these bags are also used by dog owners for picking up after their pet on walks. Scoop the clumped litter bits and place them in the baggies, tying the bags tightly. If you remove large portions of litter during cleanings, be sure to refill the box to an adequate level. 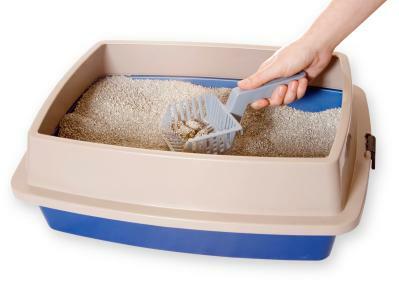 Once weekly, remove all litter from the litter pan and wash the pan with a reliable cleaner. You can also soak the pan in diluted chlorine bleach. Afterward, refill the pan with clean litter. Can You Flush Kitty Litter Down the Toilet? Many pet owners are concerned with needlessly filling up landfills with bagged litter. Flushing litter down the toilet initially seems like the more environmentally favorable method. However, this isn't necessarily the case. Sewage systems cannot inactivate toxoplasma gondii, a parasite that may be present in cat feces. This same parasite is the reason why pregnant women are told to avoid cleaning litter boxes. Toxoplasma gondii may make its way through sewage systems and into the ocean where it becomes harmful to wildlife. Disposal methods vary from one type of litter to the next. Clay litter is the cheaper clumping cat litter option, and it is typically composed of natural bentonite clay. Clay will often produce a dust during litter box cleanings. Using a litter scooper is a common method of box cleaning, but scooping up clay litter will often scatter clay dust into the air. Pet owners can easily breathe clay dust during cleanings. Concerns have been raised about potential health problems for both pets and owners from inhaling clay clumping litters. Scooping litter into small baggies is the most classic form of litter disposal. This process isn't very complicated, but it is hardly the most hygienic. Clean your scoop with bleach or disinfectant after each use. You can also store it in a zipper bag to ensure any lingering bacteria stays with the scoop and doesn't enter your home environment. Tie the bag closed and place it in an outdoor trash bin so odors don't collect in your home. Silica litter doesn't produce the same amount of dust during cleanings as clay litter does, but these products have also been linked to health problems upon inhalation or ingestion. Silica litter has also been classified as a carcinogen. Dispose in the same way as indicated above for clay clumping litter. Do not flush silica or clay clumping litters down your toilet since both have high absorption properties. This may be handy for masking odors and clumping cat waste, but when exposed to the water in your toilet plumbing, these products can swell and create pesky blockages. For users of silica and clay litters, the trash can is the better mode of disposal. Cat litter made from recycled newspaper bits presents a more environmentally conscious choice, at least where processing is concerned. However, the methods of disposal regarding this product produce similar concerns as clay and silica litter. There is no dust produced during the scooping process, but recycled newspaper is highly absorbent. It may not break apart as easily as toilet paper, so it's best not to flush it down the toilet. Although some newspaper litter manufacturers claim that such products can be flushed, the scoop and the baggie is, again, the safer method. Wheat and Corn litters do not clump as effectively as clay, silica or newspaper. For this reason, pet owners find them less risky when flushed. However, since these litters fail to clump as well as other products, watch carefully for scattered particles as you clean. Pine litters, like corn and wheat, are biodegradable. While its strong pine scent may require an adjustment period for cats, pine litter is amongst the safest and easiest cat litters to deal with. It is made from pine lumber, is non-tracking, and binds very well to waste. It is a flushable product because pine litter disintegrates so easily. In fact, the Feline Pine litter box takes even more of the guesswork out of pine litter, and its design is relatively simple. When it comes to ecologically kind litters and disposal methods, pine litter tends to be the highest reviewed product. However, its efficacy as a litter product poses entirely different issues since it's not as absorbant as clay litter and that means the litter box will need to be cleaned more often. Using biodegradable litters and biodegradable baggies will provide you with a safer and more ecologically sound method of litter disposal. Keeping your cat indoors will also lessen its exposure to pathogenic organisms that can contaminate its feces. There is no perfectly safe and hygienic method of handling cat waste but using products that will not harm the environment combined with careful disposal methods will lessen both your cat's carbon footprint and your own potential for disease.